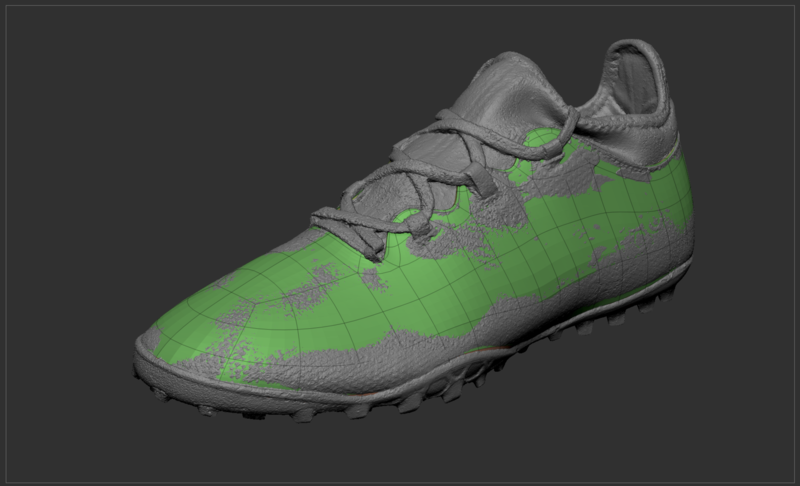 Yet another shoe scanning experiment, this time with some big improvements to the turntable setup and general workflow. After doing a load of research and picking up some new kit, the turntable is now ‘semi-automated’. The automated part is comprised of a rotating time-lapse head and a DSLR camera with an inbuilt intervalometer. Not quite a one button solution yet, but other than rearranging the tripod and lighting stands for each level of capture, it’s a pretty stress free setup and no longer requires a person to hunch over and rotate the subject in hundreds of tiny increments! After processing the images, the raw data turned out much better than any of my previous tests. The semi-automated setup might have something to do with this, due to there being less human intervention and therefore less room for human error (clumsy hands knocking things over). For this test I also increased the image count to 500 and improved the camera spacing for better coverage of the subject. In my experience, capturing the interior of the shoe is always the hardest part; by adding in the vertical camera ring it seemed to really help with filling in some of the more difficult areas. 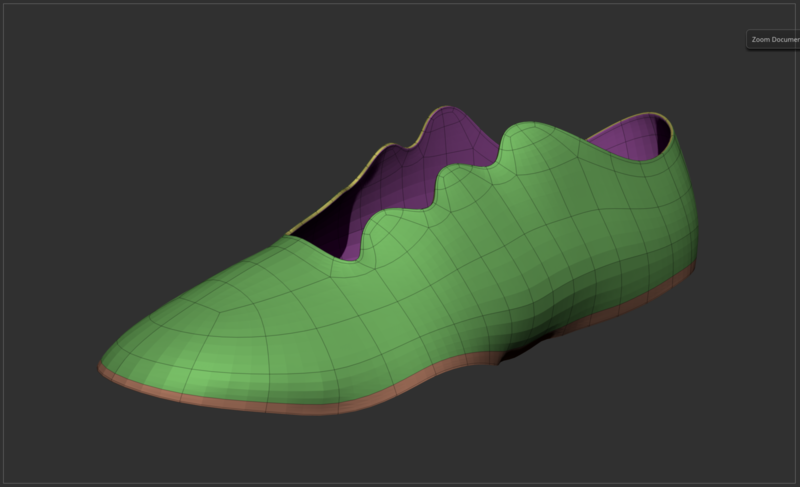 The next step is to split the model up into all the individual parts that make up the shoe. 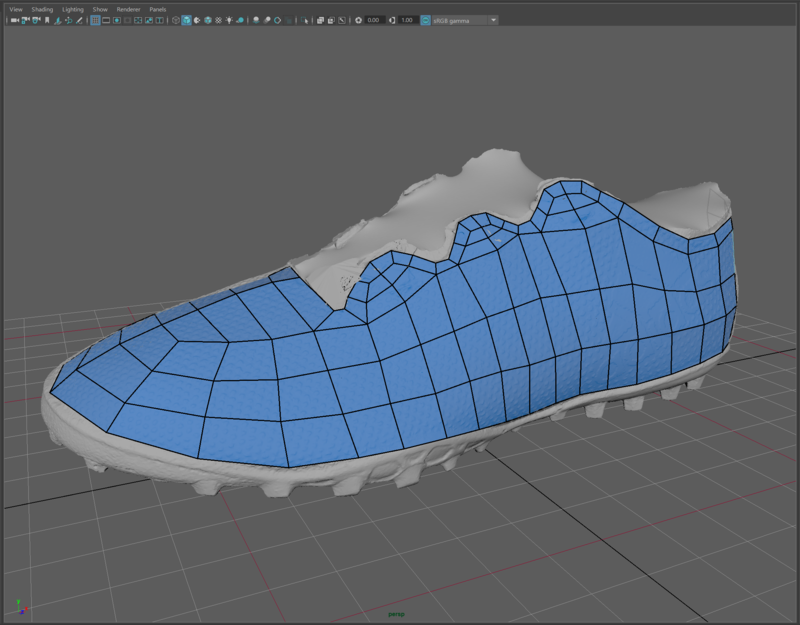 I have recently moved over to Maya for any manual retopology; using Quad Draw with Live Mesh turned on, I have found that you can quickly block out the basic shapes and then add in extra resolution which automatically shrink wraps to the surface of the scan – if you’re interested check out this tutorial by Autodesk. 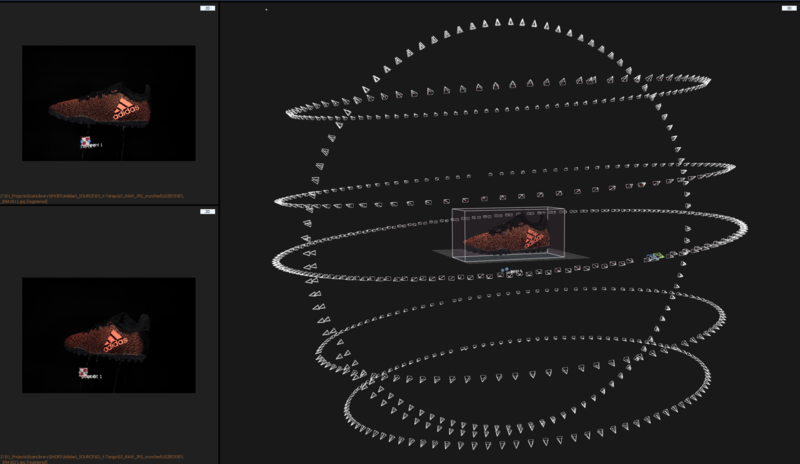 See below images to demonstrate the basic retopology workflow between Maya and Zbrush. Unfortunately I haven’t been able to find time to complete the shoe, but I hope people find this post interesting all the same. As always, I am interested in feedback, so feel free to get in touch if you have any questions or ideas on how to improve on this turntable setup. Once I have eventually remodelled the shoe and cleaned up all the textures, I will be updating this post with some rendered turntables. Stay tuned…! I did some tests with a turntable, but without the intervallometer as the DSLR I had at the time did not have any. The difference is that I shot my pictures inside a mobile packshot studio (this one: https://www.simp-q.biz/shop/Simp-Q-L-p41614884). The advantage is that it does not need a complex flash setup to operate, but it is only suited to small sized objects. Hi Kilroy, thanks for the link! Looks nice and easy to set up. I’m not sure if I could get cross polarisation working with the white walls and bounce lighting, but using a ring flash would work, and I can see they give you a black backdrop + it would be easy enough to blackout the side walls. 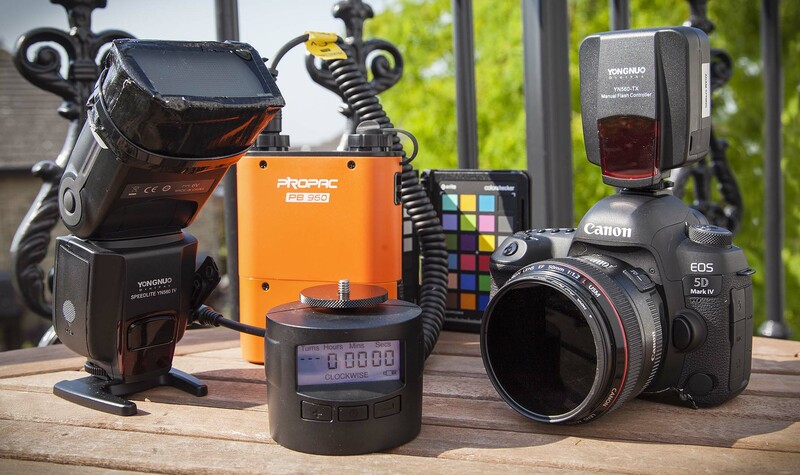 Are you using cross polarisation with your setup? How do you do cross polarization with the window light? From my understanding you take a full scan with the polarizing filters on, and then take a full scan with the polarizing filter off and subtract the two textures? Does the ambient / unpolarized light not ruin the data? And is there a way to take both scans at the same time? Hi William, thanks for reading. Strictly speaking the room should be completely blacked out so there is no light bounce. However, for this automated setup I am using auto focus on my camera so that it can readjust as the subject is turning, and in complete darkness the autofocus will not work. The polarisation I got from this shoot was still very good and the textures work well for relighting in post. Regarding your question on shooting spec and polarised at the same time; this works fine in my experience, you just need to make sure only one of the image sets are turned on when projecting textures. Hope this helps!